Nitty-gritty. : WEARING IT WITH PRIDE! 'That I refused to do anything because I am waiting for my inheritance!' I cried bitterly, that words of consolation from my hubby and mum could not comfort me. The relative denied it when confronted. What about an elderly neighbour who advised me to get something doing and not depend on my hubby because my kids are growing and there would be more expenses? This same neighbour saw I and my friend talking downstairs one early morning from her balcony and she asked if my friend was not going to work? And our Nigeria culture did not help matters sef! HUMPH! My guys, I hear am o!...hehehehe. Hence, I go on my knees and thank ALMIGHTY GOD for bringing me to America. I thank HIM for removing the veil of shame and disgrace from my face. I thank HIM for making me to have the last laugh! Some might brush this aside as no biggie, but it is to me. Being a housewife in 9ja was emotionally and physically draining! That was why I advised my friend not to resign from her job when she was finding it difficult to manage her career and children then......but today, she is coping quite well, as the kids are getting older. And, yes o, am having the last laugh....these same people are trying to curry favour from me now! One even greeted me good-morning ma when we talked, that I turned around in my room to see if another person was with me!...ahahaha...This same person who believed I deserved no iota of respect simply because I sat down at home 'chopping' my hubby's money! Another wants an invitation. And That same neighbour (she travels often) is asking for my number, but I told my friend not to give her! I just want to be left alone to savour this new phase in my life. 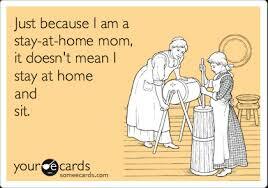 It was a surprise to me that SAHM are respected here as career women. In America, they hold women and children as first priority. During my pregnancy, I got smiles and help from strangers. Child-care is expensive, compared to Nigeria, thus, SAHM are not looked down upon because they know the women are putting their own lives on hold for a while and manage the family income. 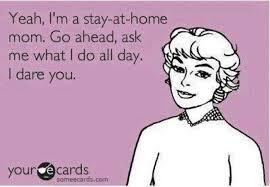 Hence, I don't feel bothered again.....I am now wearing my SAHM badge with all pride! Does it mean I encourage women to be housewives if they want to?On the contrary, NO! This is because everybody have their own level of patience, tolerance, endurance and faith.